National Tartan Day is a United States observance on April 6 each year. It commemorates the Scottish Declaration of Independence, from which the American Declaration of Independence was modeled on. 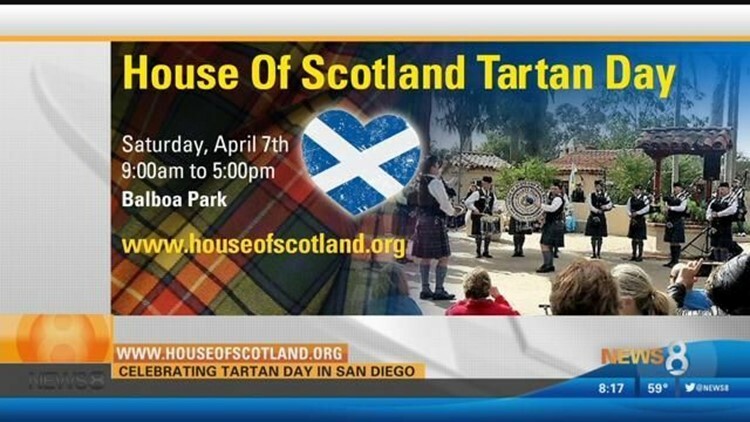 SAN DIEGO (NEWS 8) - National Tartan Day is a United States observance on April 6 each year. It commemorates the Scottish Declaration of Independence, from which the American Declaration of Independence was modeled on. It also recognizes achievements of Americans of Scottish descent. National Tartan Day parades occur in major cities across the country. These parades often feature bag-pipe bands playing Scottish music and people dressed in kilts with tartan patterns that represent their Scottish clans. Special award events are also held on Tartan Day, often organized by groups such as the American Scottish Foundation. The Scottish Declaration of Independence was signed on April 6, 1320. Almost half of the signers of the American Declaration of Independence were of Scottish descent. The US Senate Resolution on National Tartan Day was passed on March 20, 1998. From that point onward, National Tartan Day was designated as a day for all Americans, particularly those of Scottish descent.